Easy setup, way more customer signups! It was very easy to set up! Straight forward installation, and we were able to match our sites design with ease. The amount of customers creating accounts has increased dramatically. Definitely worth it! Works great, gets more account signups! Customer account signups has increased since installing this module. Customers like things made easy and this does exactly that. Puts it right in front of them and all they have to do is add a password. This is a great little module that makes the checkout process just that little bit easier for the user. Since putting the module in, it's worked flawlessly for us, and 58% of shoppers who don't have an account with us have set one up. The module is a great value for the cost. I highly recommend it. This module was less expensive than my time and solved my problem. Now, about 80% of our customers create accounts. LOVE the new features. Especially the ability to preview. This makes things SO much easier when editing! It's also nice to see how many people actually used the feature to create an account. 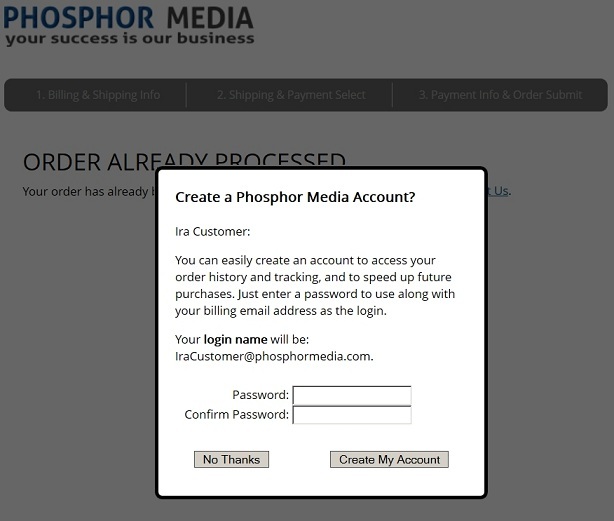 Make it easy for your customers to create an account in your store. Customers simply enter a password AFTER they have already purchased. Take that pesky "Create Account" screen out of the order flow and put it where it makes sense...AFTER the customer orders. That's the time they may be thinking of the benefits of having a registered account: order status and history, frequent shopper promotions, easier returns, etc. Easy Account is not only simple for your customers, it's also simple for you. Install module, add a single token and ...nope, that's it. And, though you could leave it as is, we also give you simple settings to make the sign up look the way you want or completely customize just about everything your customer sees through its own inline CSS styles. Easy Account keeps track of requests for sign ups, number of successful sign ups, and in the rare case, signup errors too. When a customer signs up through Easy Account, their current order is automatically associated with their new customer account. Immediately customers can now use any of the great order status and history features available for Merchant 5 and more. The latest upgrade to Easy Account makes it even easier to use; and more effective at converting one-time purchasers into repeat customers. 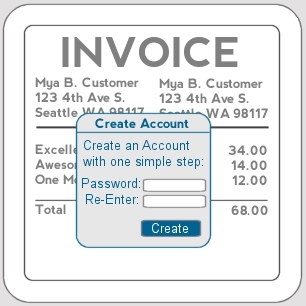 The Easy Account Sign up form now presents "on top" of the invoice screen. This focuses the attention of the your customer completely on the offer to create an account. The Easy Account Sign up form now supports rounded corners, giving you a more modern look. Our new "Preview" mode shows you an exact sample of the resulting sign up form. This makes it easy for you to create the most appealing and compelling sign up offer. Now supports tokens so you can personalize the sign up form (and confirmation message) with the customer's name and email address. This makes the message more personal and helps assure them that the sign up form is not some sort of "intrusion." New licensing and support system. Automatically notifies you when free updates are available. Easy Account is licensed for one year from the date of purchase. This includes free support, feature updates, and of course any bug fix releases. The renewal cost for Easy Account is: $20.00.